Joseph and Theresa live in a cute little blue house in the Eastex/Jensen area of Houston. Joseph, a forklift driver, grew up in this house as a kid where he lived with his parents, one sister and three brothers. It’s been in his family since the 1960’s. When Hurricane Harvey made landfall at the end of August 2017, he was home with Theresa as the flood waters started to creep in from the floor. They were trapped for several days until the water receded. As they waited out the storm, the water continued to damage the home. In the kitchen, the water heater was starting to fall into the floor. In the master bedroom, rain water soaked through the roof until it fell through creating a large hole in the ceiling and damaged the sheetrock. Strong winds from the storm caused damage to the exterior siding. The lights continued to flicker on and off, a sign that there was damage to his electrical box. When Joseph and Theresa reached out to Avenue in January, they were still living in the damaged home. Their FEMA claim was denied and they no longer had flood insurance – they were dropped from their policy after Hurricane Ike. Despite these circumstances and knowing the work that lied ahead, they remained positive and were ready to start rebuilding. Avenue assisted with vetting and hiring contractors to complete repairs after Baker Ripley provided them with a new foundation and wood floors. Contractors reframed the home and created an open floor plan to help with mobility, as both Joseph and Theresa suffer from arthritis. Avenue provided additional repairs including replacing and repairing the bathroom – now larger and with an ADA compliant toilet and shower for better accessibility. We installed new sheetrock and insulation throughout the house, new doors, baseboards and trim, new kitchen countertops, sink and faucet, and part of the roof. We replaced all the electrical wiring and installed a new electrical box and outlets, then replaced damaged windows in the kitchen and bedroom. We spoke with them as the repairs were nearing completion and asked what they were most looking forward to when they were back home. Theresa echoed the sentiments of a lot of our repair clients – she just wanted to sleep in her own bed and cook in her own kitchen. Joseph wants to relax and kick back in front of the TV and his favorite Western channels. We are happy and excited for them to be back home and doing the things they love in a safe, dry, healthy house. And with the completion of these repairs, they are house #100! 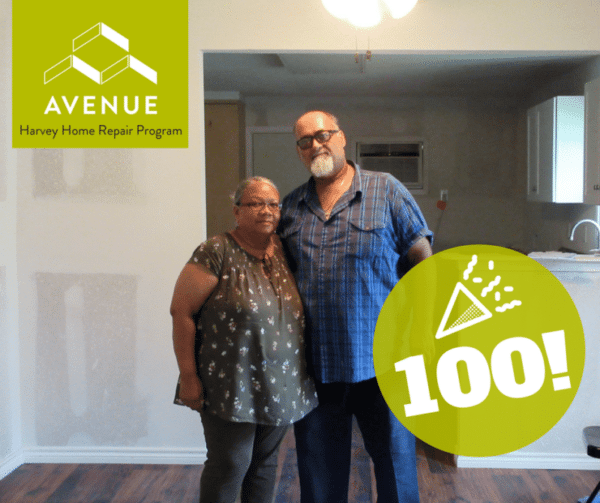 For Avenue, the work continues – many families are still displaced even a year after the storm – but for now, we celebrate #100 and raise a glass to Joseph and Theresa and say WELCOME HOME.